So, you’ve decided on the type of litter box that you want for your cat. Next, you’ll need to deal with the question of “where to put the litter box”. As always, we’re here to help out with expert advice! We’ll start this post with discussing the basic principles for setting up the location for the litter box. Next, we’ll review your home with you – room by room – to see which one is a good fit. Should you put the litter box in the bathroom? In your bedroom? 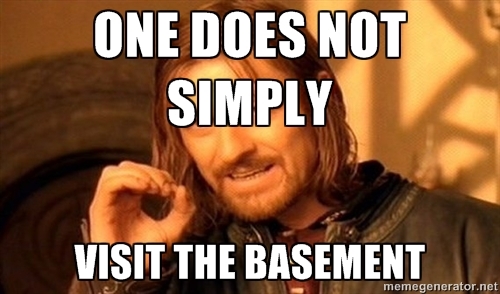 Or maybe in the basement? Rest assured, we’ll analyse these and other spots until we figure out where to put the litter box in your home. The question of where to put the litter box naturally applies to all of your boxes. Consider the following principles as you decide on the location for each one. Wondering if you should put the litter boxes together or not? Keep reading as we’ll address that point later in the post. We keep cats because we love the sweet little fluffy furballs. We want to pet them, play with them and just spend quality time together. The litter box? We could all do without that part of keeping cats, right? Still, keeping cats indoors means we have to take care of their toilets too. And that means proper litter box care. 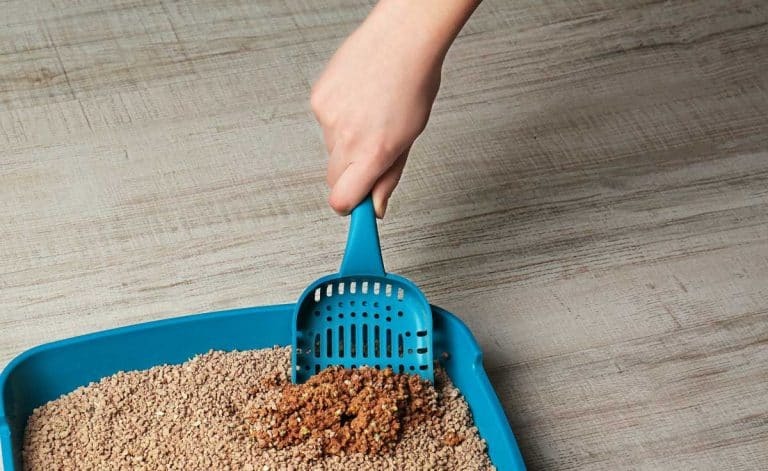 While you can reduce scooping time by using self-cleaning litter boxes, there is always some amount of work associated with keeping the litter box cleaned. There really is no getting around that part of cat keeping (unless you have a maid or a butler that handles these things for you). What does this have to do with the question of where to put the litter box? It means that you should resist the urge to place the litter box out of sight. Even if you don’t like the visuals and odors associated with the box – who does? – you still need to see it at all times. That’s the only way for any owner to monitor litter box usage. What’s more, as the old adage goes “out of sight- out of heart”. If you keep the box away from areas you frequent in your home, odds are you won’t be cleaning the box as frequently. Don’t let that happen – keep the box where you can see it. Would you place a toilet in the dining room? Putting the cat’s food or water dish next to the litter box means doing just that. And your cat won’t like it anymore than you would. If at all possible, keep the litter box in a separate room, away from the cat’s feeding station. 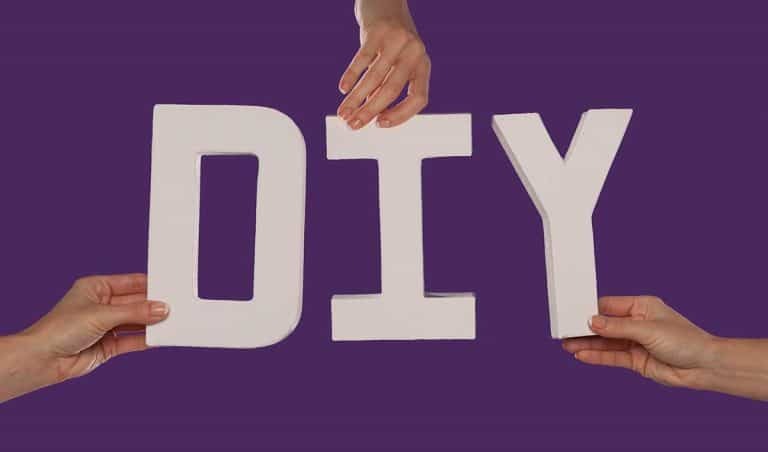 If you absolutely must have all of Kitty’s essentials in a single room – possibly the safe room you set up for a new cat in your home – keep the food and water as far away from the litter box as possible. And just as a general non-litter-box-related tip – try to place the water some distance away from the food. Most cats seem to prefer that setup. Some experts refer to the areas where a cat plays, sleeps and eats as the “nest area”. That’s where your cat feels the most secure and protected from danger. That’s where he or she will feel relaxed enough to play or take a quick nap. When considering where to put the litter box, take a minute to think where your cat tends to spend the time. Where are his or her favorite napping spots? Where do you carry your interactive playtime sessions? Try to keep the litter box away from these areas. Most humans like some privacy when using the toilets. Yes, in some cultures and situations sharing a toilet with strangers is perfectly acceptable yet for most modern people in Western culture, privacy is preferred. When you use the bathroom at home, you probably close the door behind you. Or so we hope. That’s why most people think they understand it when we tell them the cat needs a private location for the litter box. They assume it’s the same as with humans and Kitty might be a bit shy about showing his private parts and going to the toilet in plain sight. Actually, that’s not it at all. Cats couldn’t care less about their privacy in that sense of the word. After all, they are naked all day long (we don’t consider a collar to be clothes *wink* ). What does privacy mean to your cat then? In the feline context, privacy means a personal space where they won’t be interrupted by another. That other can be a dog, a toddler, or another cat. These days it can even be a robotic vacuum cleaner edging its way along the litter box. No cat will appreciate any of these interruptions. Consider which of these elements are present in your home and how you can protect Kitty’s privacy from them. Not all dogs, cats or children are likely to invade on your cat’s privacy. A lot depends on their temperament and manners. Take a moment to assess which will be a problem and where the litter box is more likely to be protected from such interruptions. Also, make sure it’s a relatively quiet area of your household. Especially one without any sudden noises. A washer or dryer going into a new cycle could be all it takes to scare a timid cat away from the litter box for good. By the same token, a group of noisy kids running into the house right past the litter box could also be a problem. So, private and quiet is what you’re looking for. Just how important that element is depends on your cat’s temperament and those potential interruptions in your home. If your cat is constantly bullied by another pet or a young child, they’re more likely to need the ability to see the bully approaching and a quick easy way out of the situation. Beyond the question of location, this is also where the type of litter box needs to be taken into account. A covered litter box has its advantages but it can make a timid cat feel “trapped” if a more dominant cat approaches the box. And that’s a recipe for litter box avoidance. We cannot stress that enough. You can’t put the litter box behind a door that may sometime be closed. Kitty must have free access to the litter box at all times. You may be able to get away with a cat “holding it” but will only work until the cat isn’t feeling well, or it’s too difficult for him to reach the box due to illness. At that point, your cat is likely to find an alternative to the litter box. And you probably wouldn’t like that. Consider the special needs of young kittens, senior cats and those with disabilities (including obesity). The litter box needs to be nearby enough for them to get to it on time. It shouldn’t be high up above the ground. Don’t make them jump through hoops. Don’t make them jump at all. If you must keep the litter box elevated – perhaps to keep it out of a dog’s reach – add small stairs for your elderly arthritic cat. And one last thing concerning accessibility – the temperature. This one is not usually much of an issue but it’s worth mentioning in case you’re considering placing the box in a part of your home that has no or poor climate control. If the box is in a very hot or very cold location, some cats may prefer to stay in the warm or cool indoors and “take their business” some place else. Now that we’ve covered the basic principles of litter box location, it’s time to review your home and figure out how various rooms and areas match up. Let’s take a quick look around the average home and see what the pros and cons are for various potential litter box locations. Can you put the litter box in the bedroom? The bedroom can be a great location for a litter box, at least as far as your cat’s needs are concerned. It definitely meets our first criteria, keeping the box within your sight – and smell range. Like it or not, you will be forced to scoop the box and keep it squeaky clean in order to completely get rid of the smell of litter. In fact, being in such close proximity to the box requires frequent cleaning to the point that you may consider investing in a self-cleaning box. That’s especially true if you work outside your home and prefer not to be hit with litter box smells when you get back home and into the bedroom. A good self-cleaning litter box can clean up after each use, ensuring the litter is always fresh and clean – and odorless. Another consideration is litter tracking. Again, this one has to do more with your own comfort than that of your cat. While you can do a lot to reduce litter tracking, it’s almost impossible to prevent entirely just around the box itself. If the box is close enough to your bed, your feet could be landing on a few grains of litter first thing in the morning. You’re around to clean the box frequently, or you own a self-cleaning litter box. What about placing the litter box in the closet? The closet could be in the bedroom, or it may be in another part of your home – but is this is the answer to your “Where to put the litter box” question? Probably not unless you really run out of floor space. Any odors from the litter box is bound to stick to your clothes. Someone might shut the closet doors, blocking Kitty’s access to the litter box. So, no, the closet is probably not a very good location for the litter box. The exception would be a closet that you’re using to store things other than clothes. The kind that don’t have any issues with odor sticking to them. Even then, consider removing at least one of the closet doors, or somehow ensuring it is always open. Can you put the litter box in the bathroom? When faced with the question of where to put the litter box, many owners consider the bathroom at some point. After all, our own toilets are in the bathroom (or a bathroom) so why not place Kitty’s toilets there as well? That’s actually not a bad idea and it works well in many households. Placing the litter box in the bathroom means you’ll be seeing it several times a day. Forgetting to clean the box is less likely to happen this way. The bathroom is usually tiled, making cleanup easier in case Kitty manages to miss the box or spray outside of it. You do need to make sure the bathroom is ventilated well enough. That’s usually a requirement from any bathroom – for obvious reasons – but when adding a litter box to the mix, the need for more circulation is higher. With clumping litter especially, it’s important to keep the box in a dry environment so that the litter grains don’t clump together. Probably the biggest problem with keeping a litter box in the bathroom is accessibility. The bathroom door would have to be open at all times. If you live alone, that may be an option for you, just remember to check on your guests whenever they’re done using the bathroom. By the way, it’s worth noting here that with a certain type of litter box – the CatGenie self-cleaning system – the bathroom is bound to be your location of choice. That self-cleaning box hooks up to both water and drain hoses so the bathroom is a good place for it. Now there’s an interesting choice for positioning Kitty’s toilets. This room is usually out of the way so not a bad choice in terms of privacy. If your washer and dryer are new, it may even be a quiet peaceful location. However, if these appliances tend to suddenly go into a loud cycle, this could be a problem, especially with a timid cat. Another issue would be the door. If you want to keep the litter box in the laundry room, either remove the door from its hinges or otherwise make sure it is always open. 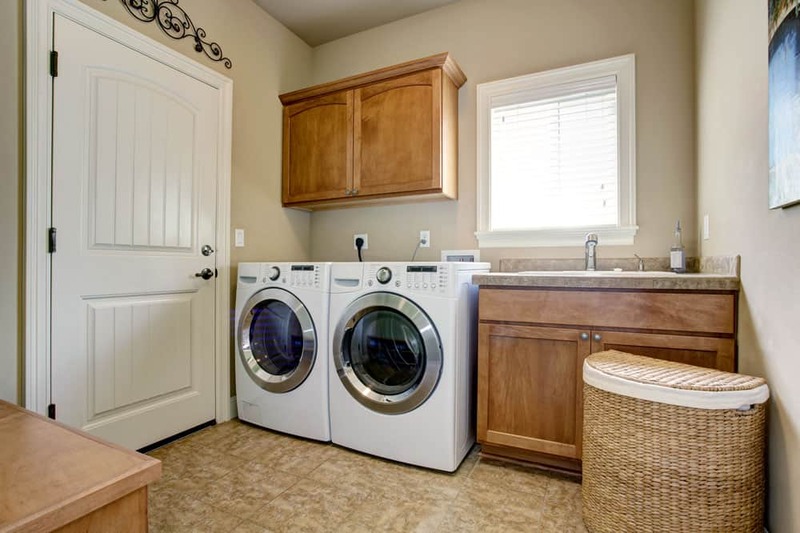 In terms of odor control, we could go either way with the laundry room. On the one hand, you don’t want litter box smells near your piles of clothes. On the other, if you keep the box very clean, this should not be an issue and the overall flowery scent of detergents and clean laundry may be a welcome feature when you enter to clean the box. Can you put the litter box in the basement? Ahh, that really depends on what your basement is like. It’s true for the felines in your life as well. However, if we’re talking about a fun warm area where people spend a lot of their time, then by all means, it could be a great place for one of your litter boxes. 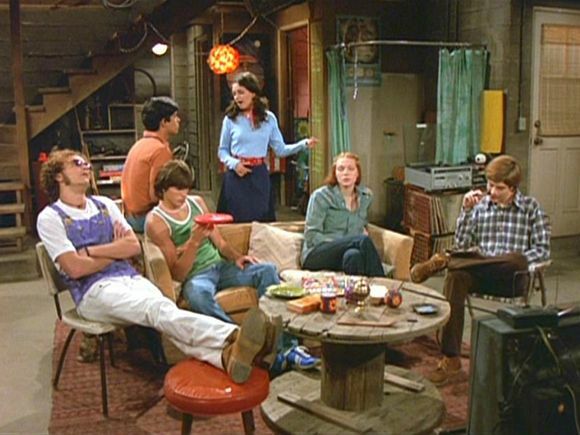 This kind of basement could work! Again, this goes back to our first criteria: You need to keep your eye on the litter box. If you visit the basement daily and spend some time there, odds are you’ll see the litter box and keep it clean too. If you never go to the basement for anything, what are the chances that you’ll even remember there’s a litter box there? Another consideration is accessibility. A frequently used basement that acts like an additional floor in your home can work very well. One that’s shut most of the day, not so much. Last but not least, we mentioned this could be a good place for one of your litter boxes. Not for all of them (even if that “all of them” means just the one). Although the hallway is not a room per se, it can be a good location for a litter box in some homes. The hallway tends to be a busy pathway so in a household with a big family and several children this area may be too crowded and noisy. However, in a home with only one or two older occupants, the hallway can be relatively peaceful. The best thing about the hallway is its accessibility. With no doors to be shut, you can be sure Kitty always has full access to the litter box. And with you walking through several times a day, you can easily tell when the box gets too dirty. Keep your cleaning utensils nearby and scooping can be done within a couple of minutes, several times a day. To summarize, let’s recap the pros and cons of the various locations we discussed so far and put everything into one organized table. A closet If it’s empty – this is good use of space in your home If used for storage, the smell will stick to your clothes. 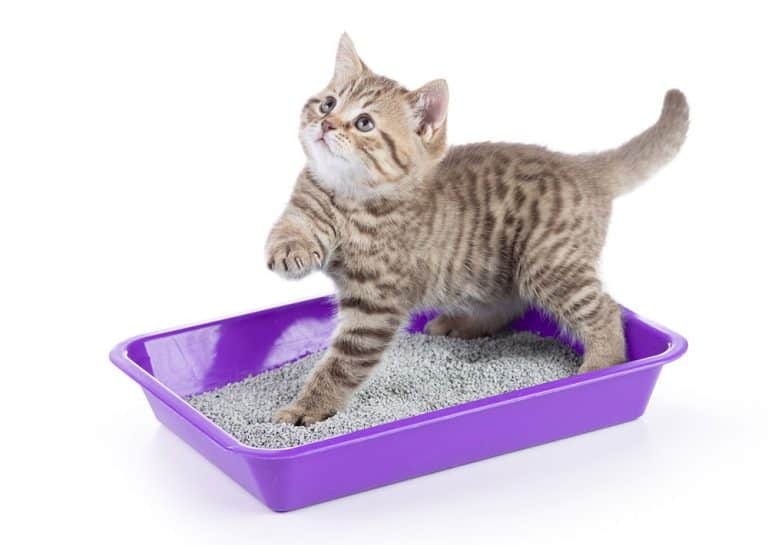 Many people have asked us this over the years – where to put the litter box in a small home. Sometimes as small as a single bedroom or even a studio apartment which is basically one space without separating walls. Prioritize your cat’s needs over your own. Don’t try to find a place where you can keep the box out of sight for yourself and your guests. Instead, keep it visible and clean it often. Invest in a self-cleaning box if you must. Make sure the box is as far away as possible from food and water dishes. Focus on giving your cat an accessible clean litter box at all times. Remember – it may be more work for you now but it beats having to deal with inappropriate elimination problems later on. As promised earlier on, time to tackle the question of litter boxes location. In plural. 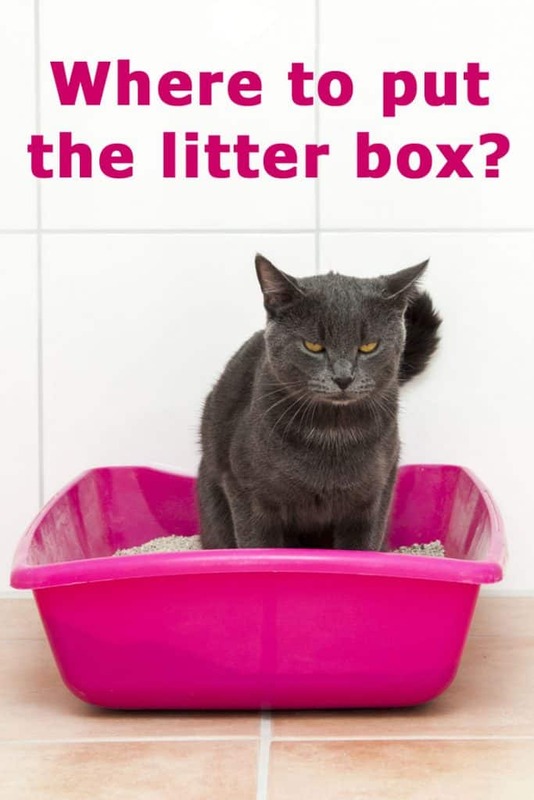 If you have more than one litter box (and you probably should) it may seem that the question of “where to put the litter box” becomes more complicated. In fact, it’s the opposite. Dealing with several litter boxes makes things easier, not harder. Here’s why. It can be difficult to find the perfect location for any litter box. Having more than one box means you can experiment with several good options and see which ones your cats prefer. Once you know all of your cats are using at least one of the litter boxes, you can experiment with moving another box and see if you can improve the situation. Remember – it’s perfectly ok to keep more than one litter box in a certain location. Whether the best spot in your home is the hallway, your bedroom or any other spot – you can absolutely place both litter boxes there side by side. Cats & apartments: Where do you keep your litter box? Where Should I Put a Cat-Litter Box? Let us know if you decided where to put the litter box! What location works best for you and why. Or just leave us any other comment or question – we promise to respond! Can You Hire Someone to Clean the Litter Box? I believe I have litter box placement down by now (though you can always learn something new about cats! ), but I wanted to thank you for this article anyway. This is an excellent resource for new cat guardians. I love how you broke down litter box placement room-by-room. Thanks again, I’ll be sharing this!